A long standing tradition for more than 40 years, this timeless festival presents Shakespeare under the stars on the lake shore. One of the country’s most distinctive outdoor venues, Sand Harbor State Park provides the perfect location for spending quality time with family and friends. And, it’s one of our favorite local pastimes and a mainstay of Tahoe’s arts and mountain culture. Tickets can be purchased online at www.LakeTahoeShakespeare.com or by phone at 1.800.74.SHOWS. 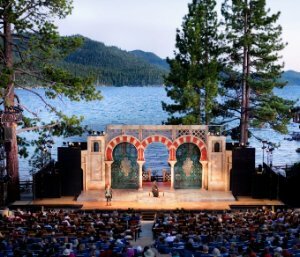 The Lake Tahoe Shakespeare Festival is a 501(c)(3) non-profit organization established for the cultural benefit and enjoyment of all residents and visitors to the Lake Tahoe region. The Festival is an advocate for producing one of the finest cultural events in the region. It annually draws more than 30,000 attendees from across the country to the Warren Edward Trepp, Jr. Stage at the Sand Harbor State Park. The Festival’s community outreach includes InterACT, an in-school residency program designed to educate future generations about the importance of the arts, theater and music and the D.G. Menchetti Young Shakespeare Program, a free series of performances produced specifically for younger audiences – presented free of charge during the summer throughout Lake Tahoe and Northern Nevada.